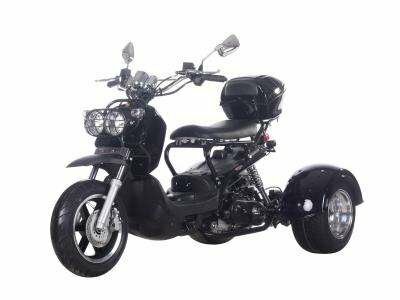 This little easy to handle 3 wheel operation power by 50cc engine a great new way to get around your destination with style. High quality steel frame, upgraded shock, high quality disc brake are all standard option. Take your daily commute from a tired ordinary ride into an exciting and flashy event. This All New 3-Wheel Motor Trike is 100% street legal in 50 States including California. It will be registered as a scooter or moped depending on the state you live in. With top speed of 35 mph, this trike is perfect for zipping around the town or to use as a daily transportation on the city roads. It has more safety features than a 2-wheel scooter or motorcycle. At 70-100 MPG and the gas prices are fluctuating, a tricycle is a smart choice for either a student looking for low cost transportation or anyone who commutes to work. Equipped with 139QMB air cooled engine, Chain driven, Differential Gear, Dual disc brakes, Bright lighting system, Fully Automatic transmission, 12" front wheel and 10" extra wide rear wheels, Aluminum rims, Big matching rear trunk, Trailer hitch... Be the first one to get this high quality 3-wheel beauty at unbeatable price and services, This impressive and yet inexpensive motor trike will make you famous in your neighborhood as " the person with that cool bike"! Metallic Black, Metallic Blue, Metallic White, Metallic Burgundy, Metallic Neon Green, Matte Black.